Cleo Queen of Egypt Video Slot Guide & Review - Casino Answers! Cleo Queen of Egypt is a 5-reel, 9-line video slot developed by Cryptologic, featuring a wild substitute of symbol, scatter wins, a bonus game and a jackpot. 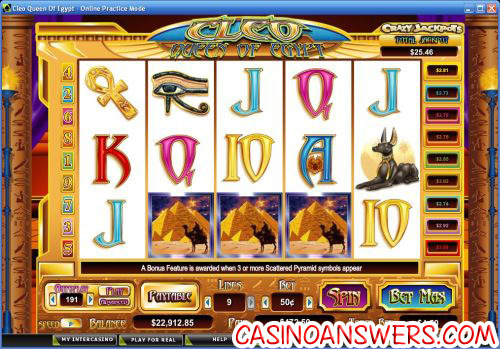 You can play the Cleo Queen of Egypt video slot game at Casino Joy and InterCasino. Bets on the Cleo Queen of Egypt are $0.05, $0.10, $0.15, $0.20, $0.25, $0.50, $0.75, $1, $2, $3, $4 and $5 per line. You can bet up to a maximum of 9 paylines per spin. You can bet as little as a nickel per spin up to a maximum of $45 per spin. To play all 9 paylines, hit the “Bet Max” button. To play any other bets, hit the “Spin” button. The Cleopatra video slot has 9 Crazy Jackpots, one for each payline. Each selected payline can win its corresponding Crazy Jackpot. If 5 Cleopatra symbols appear on a selected payline, then that payline’s jackpot will be awarded. Every player has the same chance of winning a Crazy Jackpot. The size of the wager determines the amount of the Crazy Jackpot that can be won. Crazy Jackpot wins are added to payline and scatter wins. The Cleopatra symbol is wild and will substitute for all other symbols except for the Scattered Pyramid symbol. The top fixed jackpot is the Mask symbol, which can pay out up to 750 coins. The Crazy Jackpots are an excellent way to win big on the Cleo Queen of Egypt video slot at Casino Joy. You can play up to 999 autoplay spins. Hit the “Play” button to start autoplay or hit “Advanced” to open up advanced features. You can set stop conditions, including the win threshold, cumulative win, cumulative loss, stop on bonus game and stop on jackpot. Hit the “Stop” button to stop the autoplay mode. Payouts are displayed on the Paytable. Payline wins are multiplied by the bet per line. Highest win amount is paid on each selected payline. Scatter wins are multiplied by the total bet and added to payline wins. Feature wins are added to scatter wins and payline wins. Win combinations pay from left to right except for the Scattered Pyramid. Cleopatra substitutes for all other symbols except for the Scattered Pyramid symbol. Cleo Queen of Egypt gives players the chance to win lots of cash with the Crazy Jackpots and bonus feature. The graphics and sound effects and add to the presentation of the video slot. To play the Cleo Queen of Egypt slot game, sign up and make the deposit at Casino Joy! Can players from the United States play the Cleo video slot for real money? Unfortunately, USA players are unable to play Cleo Queen of Egypt for real money. Fortunately, there are alternatives if you are looking to play a video slot featuring the Queen of the Nile. You can play the Cleopatra’s Coins video slot at the US-friendly DaVinci’s Gold Casino, Cleopatra’s Gold at the US-friendly Lucky Red Casino and Cleopatra’s Pyramid at the US-friendly Super Slots Casino. Can I play a Flash game of the Cleo Queen of Egypt video slot? You can play a Flash game of the Cleo Queen of Egypt slot machine at Casino Joy and InterCasino Instant Play casinos for real money. 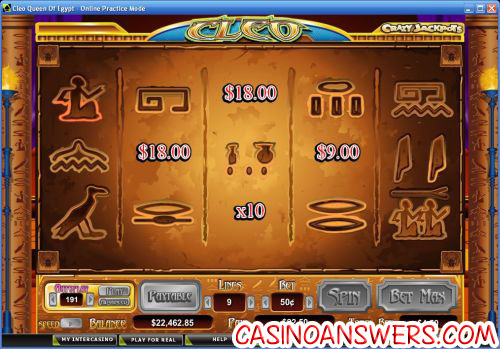 This is the best way for Macintosh players to play the Cleo Queen of Egypt slot. If you experience problems with the Flash software, install the newest version of Adobe Flash Player. Where can I find more Egyptian slot reviews? If you want to read more Egyptian-themed slot game reviews, please read our list of Egyptian slots.